As usual, the February trip was hugely successful, much being accomplished in a relatively short amount of time. Phase One of Mary’s new clinic was completed. The doors, windows and rear void were all sealed, ready for completion in September. Sigor building alterations were completed, including new doorways and a new corridor. ‘A’ frames are already in place, awaiting delivery of the tin roof. The project will be completed in September. All brickwork has been completed in the Sostin accommodation block and the ring-lintel was cast in place before we left. The roofing can proceed once we have raised more funds. There was an excellent turn out for the seminars, the Primary Seminar breaking records with 25 in attendance. A full programme of school visits was undertaken and as usual demand far exceeded supply. The availability of 2 vehicles meant that the team could be more flexible in their programme of visits. Large numbers of books and education materials were delivered to schools. Secondary schools were provided with a study booklet (compiled by the Education Team) on their set examination book, guiding teachers in the delivery of lessons. The feedback from teachers and older pupils was very gratifying and evidence from classroom visits and teacher observations clearly highlights the difference made by the Yellowmen. In all the Yellowmen support over 25 schools and could help even more if money and time allowed. 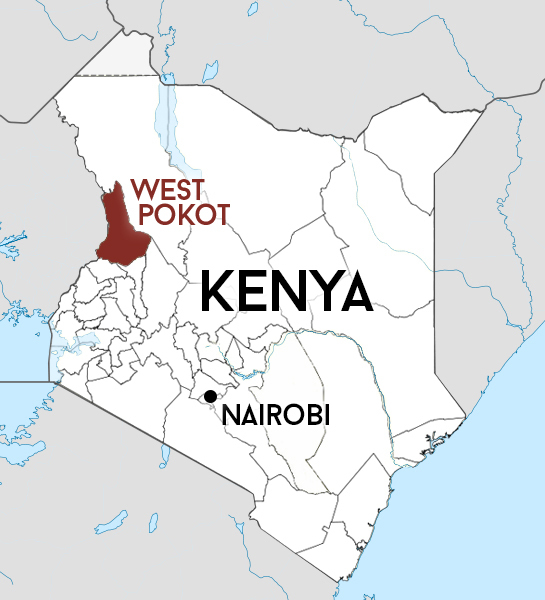 Despite being the poorest of counties in Kenya, Pokot is the only one whose results in education continue to be good. Medicines were delivered to five clinics and one hospital. In the case of at least two of the clinics, they reported that the Yellowmen provide 70% of the medicines they receive in a year. The others rely on the Yellowmen deliveries to eke out the supplies they receive from Kemsa (Kenya medical Supply Agency). Two of the Yellowmen nursing staff ran a day clinic in Sostin and followed this up by manning one of the surgeries at Tikeet. The Tikeet clinic with two consulting rooms working, managed to see, diagnose and treat 245 patients in one day. Nadia, one of the Yellowmen Nurses delivered a session on infection control to the medical staff at Sigor Hospital and gave out supplies of soap and posters translated into Swahili, to encourage further action. Several Littman stethoscopes, ear thermometers and glucose metres were given out as well as a good range of antibiotics. A second part of the medical education programme was to deliver an illustrated talk on menstruation to several girls’ schools as well as to staff at Sigor Hospital. This was followed by the supply of sanitary towels to schools and clinics. Baby clothes were delivered to the maternity unit at Sigor Hospital. The use of modern technology allowed the team to diagnose scleritis (by sending photographs to our consultant optician in the UK) and to then successfully begin treatment. Very interesting article highlighting the hard work and dedication of a wonderful team.